Thanks to their ability to manage blood pressure, remove waste from the blood and produce hormones, your cat’s kidneys play a very important role in their overall health and well-being. Unfortunately, however, kidney disease is one of the most common ailments to affect senior cats. The good news is, there are steps every cat owner can take to protect the kidney health of their pets. One way to prevent kidney disease is as simple as providing your cat with a comfortable place to urinate. The older your cat gets, the less inclined they may be to travel to a litter box that’s hidden away in a basement or garage. Make sure your cat always has a litter box nearby, and clean it out regularly so that they won’t be discouraged from using it when the need arises. In order to keep the kidneys functioning properly, a cat’s body needs plenty of fluids. Try to get your cat into the habit of drinking water throughout the day from a young age. 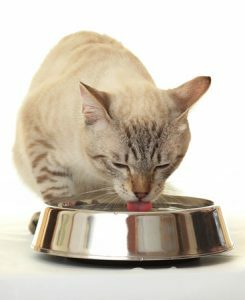 Be sure to replenish their bowl with fresh water every day, and move the bowl to a new area if they don’t seem interested in it. Many cats don’t like to eat and drink in the same spot, for example. Keeping your cat on a wet food diet can also help to ensure they get plenty of water to support their kidney health. Take your cat to the vet for routine checkups. At The Cat’s Inn, our goal is to keep cats of all ages as comfortable as possible. Call us at 877-228-7466 to place an order for a townhouse, bed or pillow for your cat today.